Okinawa’s links across the Pacific were strengthened by science this March, as OIST received a US$25,000 donation from the Worldwide Uchinanchu Business Network (WUB). 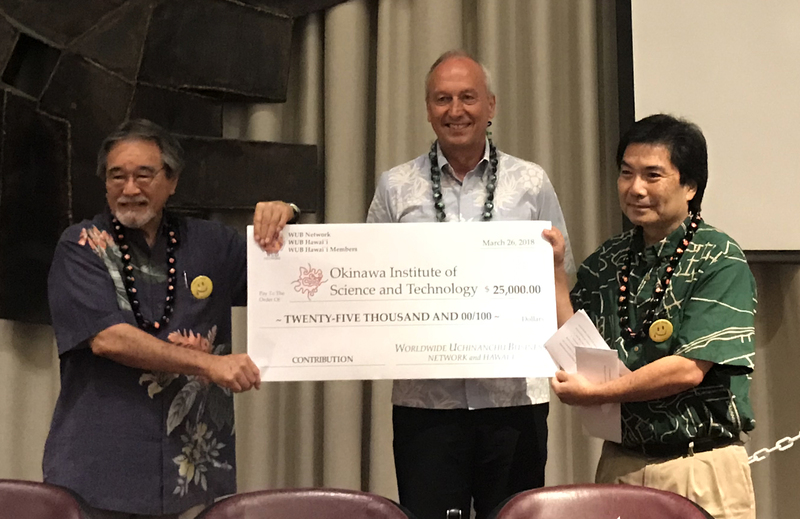 The donation was gratefully accepted by OIST President Peter Gruss as he headlined the Uchinanchu Talk Story VII Conference, organized by WUB Hawaii and held at the East-West Center in Hawaii. WUB network is a nonprofit organization dedicated to promoting business, education and cultural heritage for Uchinanchu (the Okinawan word for the people of Okinawa both at home and abroad). The group aims to help grow Okinawan business, as well as support education for Uchinanchu around the world. 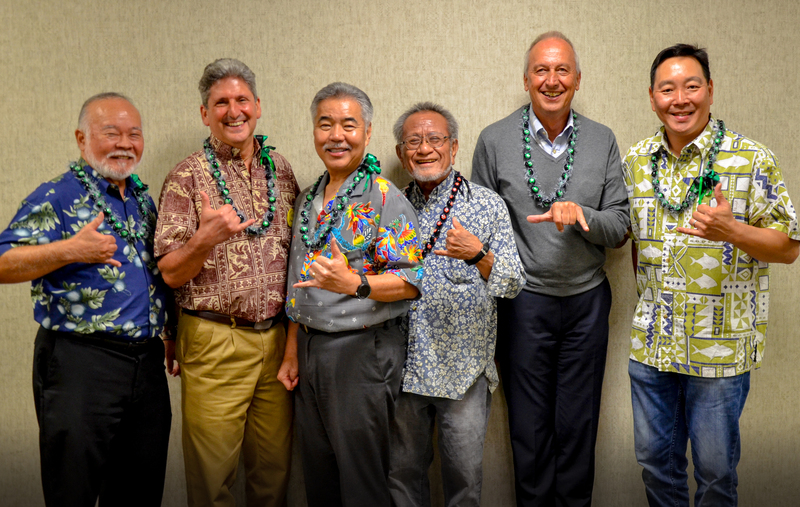 WUB has a strong connection with OIST, with WUB founder Bob Nakasone having recently been appointed to a member of the OIST’s Board of Councilors. “Our network of Uchinanchu and Uchinanchu at heart reaches around the world with 26 chapters from different countries and regions,” wrote WUB network president John Toguchi. “WUB network look forward to a long relationship with OIST”. The generous donation will be used to further the educational opportunities of Uchinanchu, with the funds being put towards OIST’s school outreach programs, to inspire enthusiasm for science through on-site science lectures and participatory, hands-on classes. The donors also expressed hope that OIST will work with concerned community members in creating a firm base of Science, Technology, Engineering and Mathematics for generations of Okinawan students. This year’s conference bore the title “Views from the Cutting Edge”, and gathered speakers to discuss the issues of Science, Technology, Engineering and Mathematics (STEM) in both Okinawa and Hawai’i. The President was the keynote speaker at the conference, where he delivered a speech outlining the importance of STEM in finding solutions to the world’s pressing problems, such as climate change and depletion of natural resources. He was introduced by Koichi Ito, the Japanese Consul General in Honolulu. The speeches were followed by a panel discussion on the challenges and benefits of STEM education, which alongside President Gruss featured Dr. David Lassner, president of the University of Hawai’i System; Prof. Kenneth Kaneshiro at the University of Hawaiʻi at Mānoa; Glenn Lee, a science teacher at Waialua high school; and Hawaii state governor David Ige. As the proceedings ended, President Gruss was presented with the donation by John Toguchi and John Tasato, the conference chair. With new links to Hawai’i, OIST looks forward to a long and fruitful relationship with the WUB network, and continues its vision to enrich the scientific landscape in Okinawa and beyond.